SAAHPC2012 is being held at Argonne National Laboratory in the TCS Conference Center (Building 240), just inside the main Argonne gates. Attendees must stop at the Visitor's Information Center outside of the main gate. 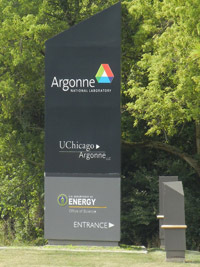 Due to security requirements at this U.S. Department of Energy facility, ALL non-U.S. attendees must complete Argonne Foreign National Registration Form/593 to ensure access to Argonne National Laboratory. Those required to complete this form will be directed to it during the registration process. ALL approved attendees will be issued gate passes to allow them to enter the Argonne facility. For directions to Argonne, see "Directions" below. An on-site shuttle schedule is available. We have reserved a block of rooms at the on-site hotel, the Argonne Guest House. Call by June 20 to secure the discounted rate. To book: Call 630-739-6000 or toll-free 800-632-8990; be sure to mention "SAAHPC"
Argonne National Laboratory occupies 1,500 wooded acres about 25 miles southwest of Chicago (see map). To reach Argonne from O'Hare International Airport (ORD), take I-294 south to I-55. Exit west on I-55 (toward St. Louis) and continue for about four miles to Cass Avenue. Exit south on Cass and turn right at the Argonne sign on Northgate Road, immediately south of I-55. Follow Northgate Road to the Argonne Information Center (AIC) between the hours of 6:30 a.m. and 4:55 p.m. or proceed directly to the main gate if the AIC is closed. You will need to show a photo ID issued by a governmental authority along with the indicated INS documents (visa, passports, I-20, I-797A and/or DS2019) for all non-US citizens. Special access requirements apply for non-U.S. citizens and Argonne will not allow anyone on-site without this documentation. Then with prior approval you can receive a gate pass. To reach Argonne from Midway Airport (MDW), take Cicero Avenue north to I-55. Enter I-55 south and continue for about 14 miles to Cass Avenue. Exit south on Cass and turn right at the Argonne sign on Northgate Road, immediately south of I-55. Follow Northgate Road to the Argonne Information Center (AIC) between the hours of 6:30 a.m. and 4:55 p.m. or proceed directly to the main gate if the AIC is closed. You will need to show a photo ID issued by a governmental authority along with the indicated INS documents (visa, passports, I-20, I-797A and/or DS2019) for all non-US citizens. Special access requirements apply for non-U.S. citizens and Argonne will not allow anyone on-site without this documentation. Then with prior approval you can receive a gate pass. The Theory and Computing Science (TCS) Conference Center, Building 240, is home to the Argonne Leadership Computing Facility. Once you have picked up your gate pass, you may proceed through the main gate. Immediately after you pass through the gate, turn right at the first stop sign. TCS is the first building on your right. Going south on Cass Ave. from I-55, you will see this marker for the main entrance to Argonne. Turn here. At the end of North Gate Road right before you reach the Gate House, you will see Building 224, which is the Visitor Center. Please enter the parking lot and proceed inside to get your badge. You will see Building 240 (Theory and Computing Sciences) past the Visitor Center to your right (if you're facing the Gate House). Proceed towards this building and park anywhere in the parking lot. You can proceed directly to SAAHPC if you enter through the east entrance to TCS. Alternatively, you can elect to use the main entrance. If you use the main entrance, stay to the right. When you see the two doors pictured here, use the right door to go downstairs to the conference center. The left door is for upstairs. At the bottom of the stairs, you will see a rock garden. Stay to the right and you will see the glass doors into the conference center almost immediately. There are various car rental companies available for transportation to/from Argonne. In general, limousine service to Argonne from the airports tends to be less expensive than a taxi or car rental. IMPORTANT: If you are staying at the Argonne Guest House, we recommend you either drive or call United Limousine (UL) at (800) 331-9037 for transportation to/from Argonneplease let the operator know you are travelling to Argonne National Lab. UL is a contracted provider and can assure your driver meets security clearance criteria. An on-site shuttle is available for attendees. A schedule is available. Hours: 6:45 a.m. - 8:30 a.m., 11:00 a.m. - 1:30 p.m., 5:00 p.m. - 8:30 p.m. Hours: 11:00 a.m. - 2:00 p.m., 4:30 p.m. - 9:00 p.m.; Sat.-Sun. 11:30 a.m. - 7:00 p.m. Directions on how to connect to the guest wireless network.